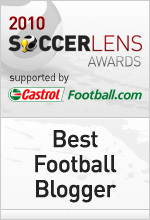 1) You’ve been nominated for Best Football Videos Site, chosen by both fans and industry experts, how does it feel? It’s always good to be recognized and commended for the work we do, if you can call it work. The team behind Soccerclips is comprised of only the staunchest football fanatics and we argue, fight and enjoy the game just like everyone else. Doing what we love is great, but getting an extra pat on the back is even better! 2) What kind of year has 2010 been for SoccerClips? It’s been a year of modifications more than anything else. We did a complete makeover in the summer, and we are continuing to build the site as time and resources allow. 2010 was about resetting the foundations and rebuilding our fanbase, and from the great results seen so far, I think we achieved what we set out to do. Consistency. We’ve been around for a while and although we aren’t looking to become the next Facebook or Twitter, we do recognize the importance of giving fellow fans what they want. As fans ourselves, it’s usually easy enough to see what needs to be tweaked or adjusted. It’s a well known fact that if you drop your high standards or if you are unable to keep up with the changing times, people will lose interest in your product and go elsewhere. Probably TV Golo. They have such a simple approach to their layout and design. You go in and get what you want pretty easily. No fuss, no messing about. 5) What’s next for SoccerClips? Short of being taken over by rich oil tycoons a la Chelsea or Man City, we’ll continue to do what we think is best for the site, while maintaining our identity. We are also interested in developing partnerships with third party sites and companies within our niche. Blogs, livescores and livestreams are recent additions to Soccerclips but we have quite a few more features to add as we approach 2011. We’re also open to ideas from interested fans, so just about anyone can make a suggestion using the “Contact Us” link in our footer. I’ve seen it everywhere. I’m sure the rest of the team has as well. You can barely watch Press Pass or visit Soccernet without noticing the conspicuous red, white and green banners. It’s a tall order to do what they are doing, but I think their approach is definitely the most sound and objective method I’ve seen to date. Castrol ranks Messi above Ronaldo so clearly the system is working fine. Messi is the best by a country mile.